June is the perfect time to go. The weather is usually pretty good, everything is still so green and fresh and new, and the days are long; really long. 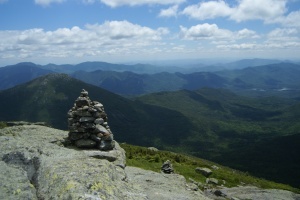 The hike is 15 miles long, so this means that it can be accomplished in one long June day. I picked the weekend, convinced my parents and in-laws to watch the little two who were both thrilled to spend time with their grandparents, bought good quality hiking boots and kid-sized Camelbak’s for the kids, and we were set to go! Lake Placid, NY is one of our very favorite towns. If you have never been, I highly recommend spending some time there. It is truly a four season destination. 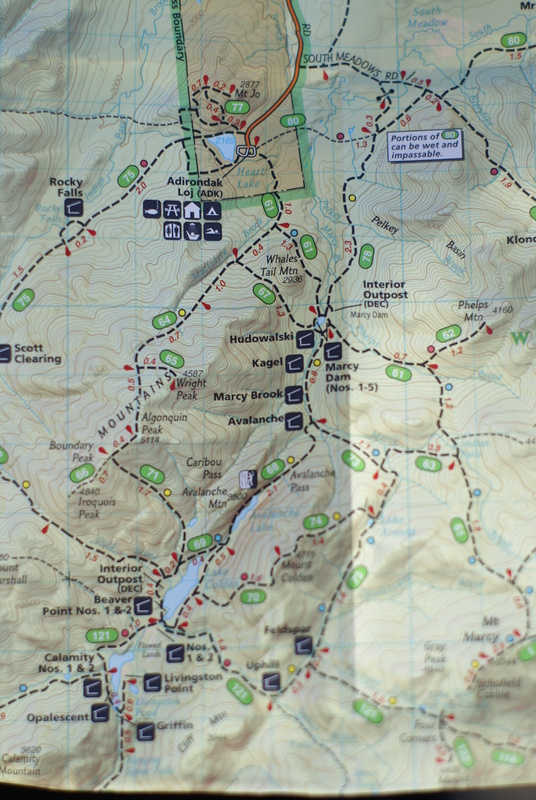 You can hike, swim, bike, kayak, climb, and take extremely scenic drives. 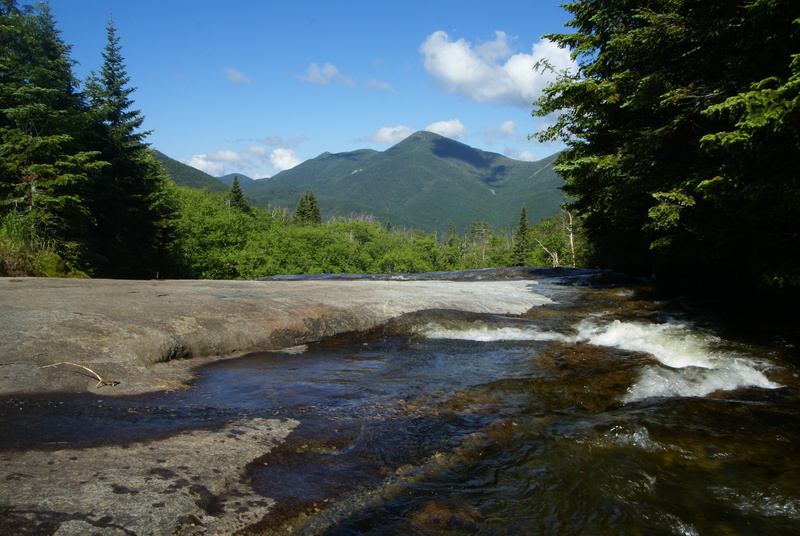 It is nestled among the Adirondack’s High Peaks. Lake Placid, of course, was home to the 1932 and 1980 Olympics, so winter sports abound! You can ski or snowboard at Whiteface Mountain, try bobsledding or the luge run, check out the Olympic Ski Jumps, ski at the Cascade Cross Country Ski Center, ice skate at the Lake Placid High School Speed Skating Oval, ice climb, take a dog sled ride on Mirror Lake, etc, etc. Lake Placid also hosts the Ironman Triathlon in the summer and has a great main street filled with surprisingly good restaurants, coffee shops, and a great variety of shopping from home decor to outdoor outfitters. It is also one of the most active towns I have ever seen. Everyone there is outside doing something: running, biking, walking their dogs, hanging at the beach; just enjoying being in nature! 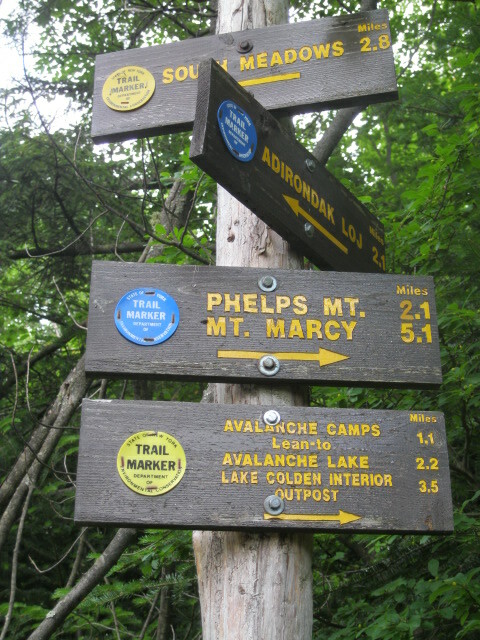 This trip we stayed at a motel on the outskirts of Lake Placid because it put us closer to the trail head for Mount Marcy. We got in Friday evening, had dinner, and prepared for an early Saturday morning to begin our hike. I woke up at 4am Saturday to rain and fog and, when I checked the weather on my phone, it looked like the fog and low clouds would hang in there for awhile. So, we quickly changed our plans and decided to wait a day to do the hike. 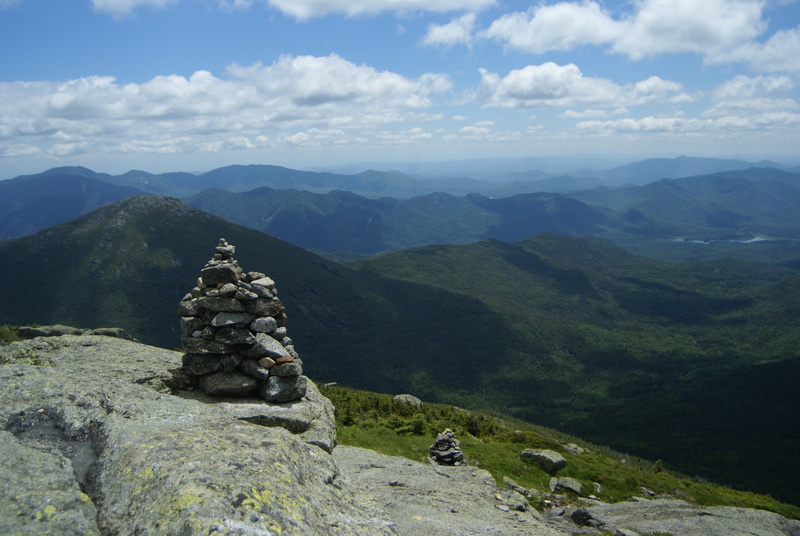 That would mean we would have to make the 5 hour drive home after hiking all day, but what good is a hike to the highest peak in NYS if you cannot see anything! Instead we spent the day exploring some back roads and streams and had a great relaxing day. 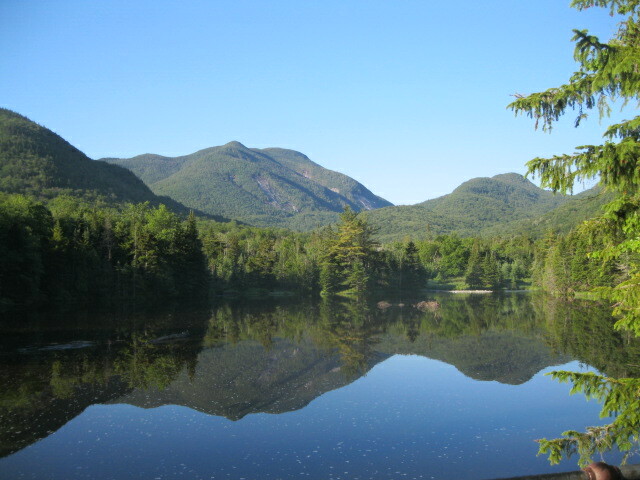 We never lack for things to do in the Adirondacks! We definitely made the correct decision to wait because, when I awoke at 4am the next morning and peered out into the already brightening skies, I could tell that the day would be perfectly clear and sunny. We woke up two very groggy and grumpy kids, quickly got dressed, grabbed our packs which I had packed the night before with a gourmet meal of PBJ sandwiches, granola bars, apples, chocolate, and water, and we were off! The short drive there took us to the Adirondack Loj Rd which has amazing views of the peaks in the distance. This early summer morning, a low fog hung in the valley’s below the mountains creating such a beautiful scene that we had to stop to take it in and take a few pictures. 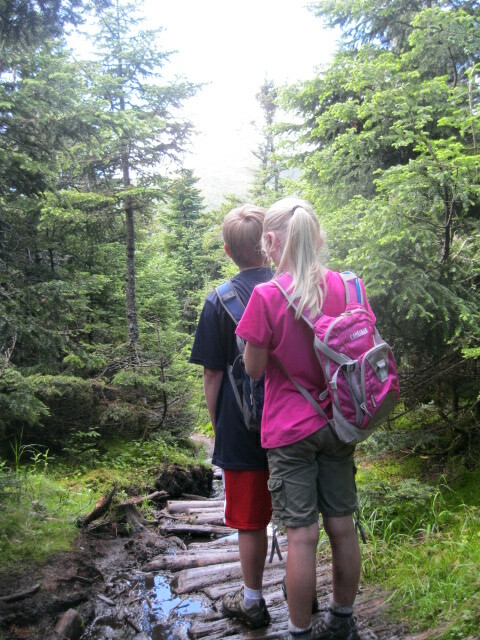 Soon after we made it to the trail head, signed in, and our hike to the highest mountain the kids had ever hiked began! The first few miles were relatively easy and flat, with the kids skipping and running ahead singing and telling jokes. Soon we came to Marcy Dam, an absolutely beautiful lake ringed by mountains that had been created by a wooden dam. We stopped here and ate breakfast and enjoyed the now-risen sun and the view. My husband’s comment that a wooden dam would not last forever, turned out to be prophetic when, in late August, Hurricane Irene destroyed the dam. We were saddened to hear about it and realized that we were some of the last people to stand on that old dam! After Marcy Dam the trail started to climb and the kids grew more quiet. We let them dictate the pace and our stops. When they needed to stop and rest, we stopped. Our pace was slow, but they never burnt out and felt like they could not go on. There are so many interesting things to see on the trail anyway. Rushing it would have made us miss out! Soon we began to near the top of the mountain and the trail narrowed and the trees grew stubbier. The final push up was out in the open as we had passed the tree line. 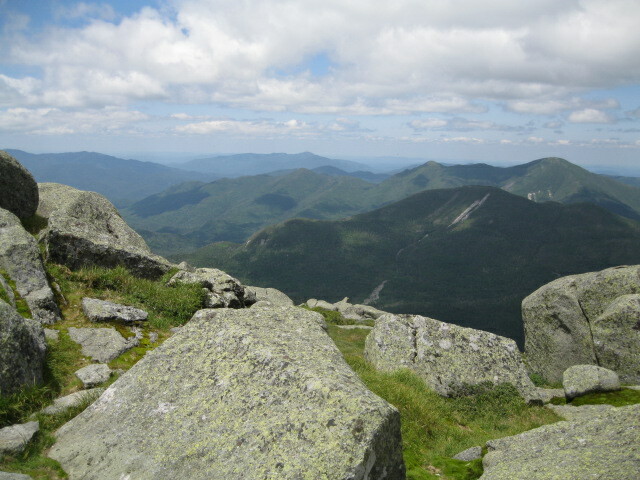 We climbed up and over rocks, following arrows and carins, until, suddenly, there we were at the top! We collapsed, took off our shoes, and admired the 360 degree view around us and had fun picking out the mountain peaks in the distance using the guide that I had brought with us. The top was fairly crowded, lots of people admiring the view on that beautiful day. They were also all impressed with the kids; my daughter, at 8 years old, was by far the youngest up there that day! All too soon we knew it was time to head down. We headed down the same way we went up, taking frequent breaks dictated by the kids. My daughter needed more stops towards the end, but never did they feel like they could not go any further. We remained positive and encouraging and kept the whole day fun. The hike is actually not a difficult one, we have gone on much steeper, harder hikes; it is just long. But, we did it! We reached our car around 6:30pm, everyone hot and sweaty and proud of what they had accomplished! Back at the motel, we went for a quick swim, showered and piled in the car for the hardest part of the day- the drive home! A fifteen mile hike has nothing on a 5 hour car ride! Don’t give up what you love just because you have children. Instead, include them, they can do so much more than we realize especially when they see their parents enjoying the activity. Kids need to be challenged. Accomplishing something difficult builds self-confidence and encourages them to push themselves in the future. 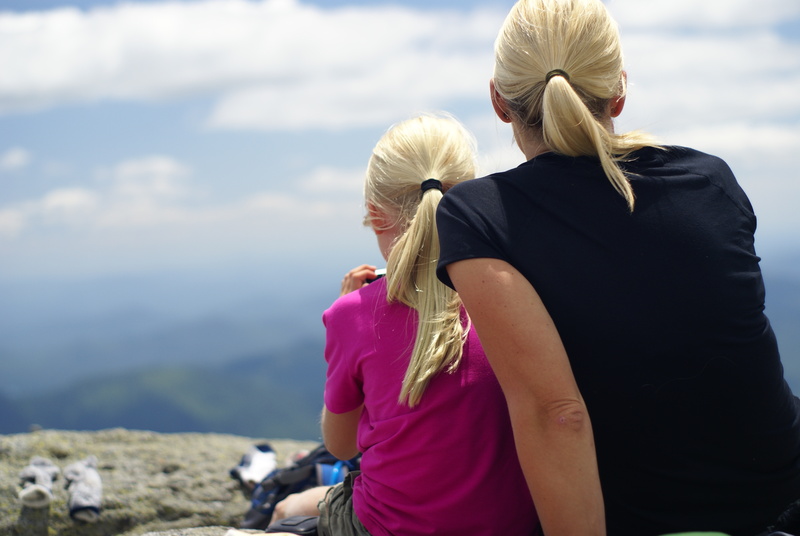 My kids still talk about Mount Marcy and tell the little two that soon it will be their turn! I loved your story and was impressed that you took you two children with you. I lived in New York for around 6 years and sadly never made it to Mt. Marcy. From your photos it looks amazing and how wonderful you were able to experience this with your children. Best of luck to you on the adventure you undoubtedly will take in the future.